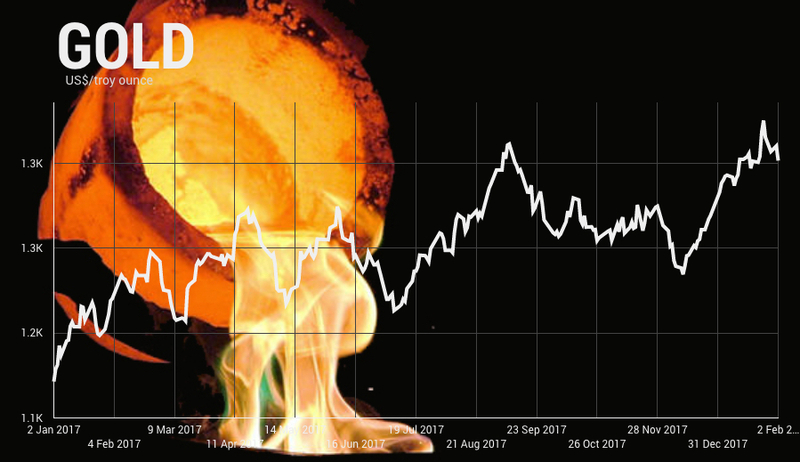 The survey by the London Bullion Market Association of analysts' predictions for the gold price this year suggest a wild ride for bullion after a fairly uneventful 2017. "Opinions differ as to the level of US real interest rates, the likely impact of geopolitical factors and the pace of global economic growth. Our contributors are divided as to what will have the greater impact and hence we have received forecasts for gold as high as $1,510 and as low as $1,120 and it’s a similar story for the other metals." While gold is predicted to trade in a wide band in 2018 year the average of $1,318 a troy ounce is not far off Friday's levels. Gold was under pressure in New York on Friday with metal for delivery in April exchanging hands for $1,332, down $16 on the day as bond yields in the US spike to four year highs. Rhona O'Connel of Thomson Reuters GFMS is the only analyst to see a spike above the $1,500 mark but for an average over the course of the year Adam Williams of Metal Bulletin and Frederic Panizutti of MKS, a refiner, are the most bullish with predictions of a $1,365 average. The winner of the 2015 competition, Bernard Dahdah of French investment bank Natixis, is a notable bear and predicts gold to fall as low as $1,120 and a average $90 an ounce below current prices. Robin Bhar of Société Générale is the most pessimistic about bullion's average value in 2018 – $1,215. Ross Norman of Sharps Pixley, London's top bullion broker, forecasts a tight range for gold; $1,260 on the downside, a $1,400 high and $1,358 average. Norman has been the most accurate forecaster in recent years coming in as the outright winner five times and a runner up four times. Silver is forecast to increase by 4% in 2018 to average $17.81 an ounce. Forecasters are bullish about the prospects for platinum which is predicted to add 3.1% on average while high-flying palladium – last year's best performing precious metal alongside rhodium, will ease back to $1,080 during the year, a $80 premium to sister metal platinum's annual average.